Founder of Universal Medicine since 1999, Serge Benhayon is a renowned presenter, practitioner, principal trainer and founder of a series of therapies complementary to medicine, as well as the author of 9 books to date. His books are rich philosophical works on the Esoteric in life, love and human society. Serge is also the founder of The Esoteric Practitioners Association (EPA); an in-house governing body that manages and accredits the therapies. 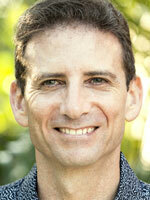 Serge Benhayon's teaching schedule is extensive, both in Australia and internationally as are his practice hours. "Serge is known as the "the healer’s healer", he communicates Sacred Teachings through Esoteric Healing." ~ J.W. Read more about how Serge Benhayon and Universal Medicine got started in Serge Benhayon's short dossier and in a brief history of Universal Medicine here. Phone the clinic direct to make a booking. Please note session bookings are not available via email.